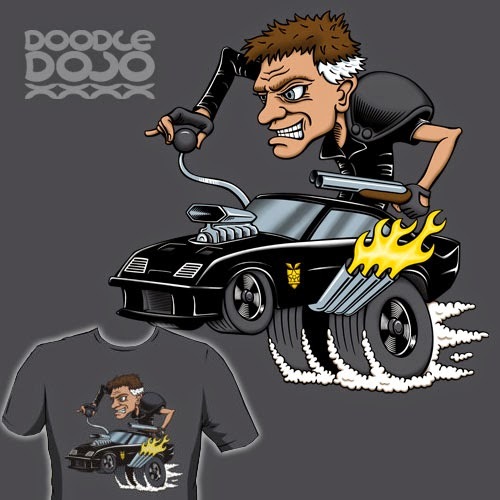 Max Rockatansky, driving through the outback in his V8 Interceptor, looking for injustice and righting wrongs. Keep it up long enough and it would drive anyone mad. A tribute to a classic movie series and a classic artist. Ed Roth created Rat Fink who drove around in some crazy custom hot rods. I figured that his style could work well with Mad Max. After all he loves his cars too, especially his V8 Pursuit Special. Also available at the Doodle Dojo Etsy Store. Also available on iPhone cases, posters and greetings cards from RedBubble as well as prints, laptop skins, and iPhone skins from Society6.